A spray gun is a part of a pressure washer through which the pressurized water comes out and hits the surface that it’s going to clean. There are few parts of a spray gun such as the gun, spray wand, nozzle, trigger, etc. If you want you can buy these parts individually or you can buy them together. The shape of this part is like a real gun and that is why it is called the same. The user holds the gun tightly keeping one finger on its trigger. The wand is actually nothing but a long metallic pipe with connecting points at its both ends. It gets connected to the gun on one side and to the spray nozzle on the other side. Nowadays most of the spray wands come with quick connect ends for the user’s easy handling. The nozzle tips are one of the smallest parts of the entire machine. You need to attach them at the tip of your spray wands. Their work is to decide spray quality or how will be the speed of the water. Different nozzles are a 0-degree jet point, 15-degree, 25 degrees, 40-degree, 60-degree and detergent applicator. 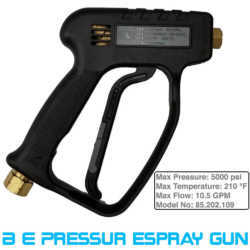 This is one of the best spray guns that is available in the market which has the capacity to hold 4000 PSI water pressure. 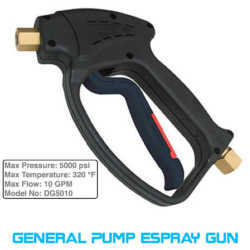 The spray gun includes a gun, a wand and nozzle kit for gasoline and electric pressure washer. The length of the wand is 19” with 1/4” quick disconnect end. It also has two hose adapters to convert the spray gun inlet to male metric or quick disconnect fittings. This kit is suitable to use in high pressure and it can be used for residential purposes such as cleaning sidings, floors, fence, etc. The one pound weight allows you carry and uses it very easily. This spray gun can tolerate around 5000 PSI water pressure and for this along with residential use it can be used for commercial purpose. The maximum water flow rate is 10.5 GPM and the maximum temperature it can tolerate is 210o F. It also has ¼ Female NPT output along with 3/8 Female NPT inlet. This kit can be used for heavy duty residential or commercial cleaning. The shape and size are pretty comfortable to handle and use. This is a spray gun made by General Pump company that has a good reputation in making pressure washer parts. The maximum water pressure it can tolerate is 5000 PSI which is quite high for residential use and enough for commercial use. This kit has an NPT type connector for easy connection. This gun has an additional venting for excellent high-temperature performance. The grip and the performance are commendable. You can use this part for residential and commercial purpose both. 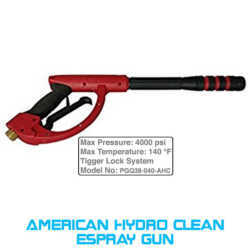 American Hydro Clean has made a very lucrative spray gun for stylish users. 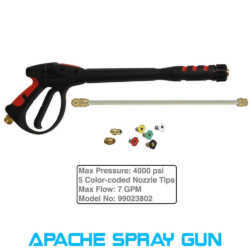 The maximum capacity of this kit is 4000 PSI and it can tolerate the temperature maximum 140o F. This gun has on/off facility that allows the users to turn the kit as their wish. Because of its ergonomic design, it reduces fatigue. You can easily use it for your residential heavy duty cleaning and medium duty commercial cleaning. The temperature tolerance capacity will make the oil and grease cleaning easy and effective. 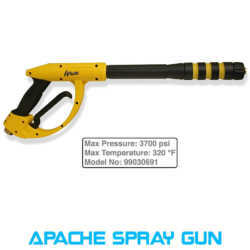 This is another stylish spray gun by Apache which has a very attractive look. The weight of this kit is around 2 pounds that certify its strength and durability. It has a unique reverse trigger and cushioned handle for reducing the hand fatigue. The water pressure it can tolerate is 3700 PSI and it can tolerate maximum 140o F temperature. Its ergonomic design and weight provide the facility for prolonged usage. It has 3/8 Female pipe thread inlet. This gun has an easy-connect facility at its both ends for easy installation. Check Spray Guns on Amazon!